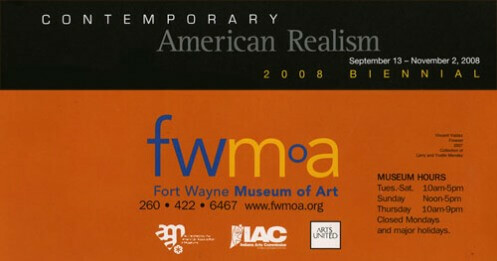 This coming Saturday, 13 September 2008, the Ft. Wayne Museum of Art will preview their Biennial Realism Show. I was honored to have two paintings chosen to be included, Where There’s Smoke, and Just A Spoon Full. Below is the invitation and a link to their website. They will be publishing a catalogue of the show which is available there, as well as information on a Symposium: American Realism Explored, on Saturday October 11, 2008 at the museum. Posted in: Contemporary Realism, News Flash ! I’ve been saving up a few favorites to pass along and this is at the top of the list. The Lace Reader, by Brunonia Barry… Many of you NPR listeners may have heard the interview a few weeks back with the author and her husband. They shared the story of their publishing phenom which rocketed this book from a self-published stack of pages to a multi-million dollar book deal. Caught my attention but the book itself is a winner. I listened to it while doing the last painting and actually read it twice to go back and catch some of the early clues that drifted away. It is a superb mystery and beautifully crafted. I found my way to her website, and blog in which she mentions doing an interview with Diane Rehm…so I downloaded the podcast of it and listened AFTER reading. (There was a much anticipated surprise ending that I didn’t want to spoil). Not since discovering Laurie R. King and her brilliant writings have I enjoyed a novel as much. Here’s a link to the website and her blog is there as well. When she left early yesterday morning to get her 16 year old volvo (with 400,000 miles on her !) washed … and drove out of the driveway with the trunk wide open…I knew Pat was pretty excited. There had been a flurry of phone calls from headquarters the day before announcing a last minute Obama rally in Lancaster and Herself was to be given a vip pass. As a steadfast volunteer for the local Democratic Party, Pat has been in the trenches for many months…showing up to do anything they have asked…even the smallest, dirtiest jobs…putting her time and energy with a birkenstocks-on-the-ground attitude into being an active citizen in pursuit of real change. No armchair complaining for this grandma ! She IS the change she has been waiting for ! And all along the way…through the long months of this primary season…she has been an ardent, sometimes rabid, supporter of her heros Barack and Michelle. So, when she came running over to the studio to tell me that she was going to be given special access to this rally…I swear her feet did not touch the ground ! 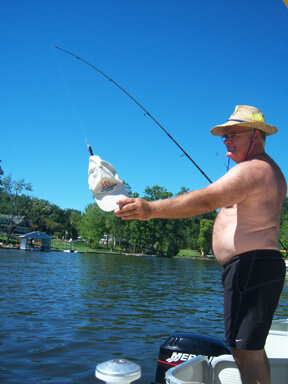 Now it was hot yesterday. I mean well above 90 degrees. And Pat had agreed to carpool and pick up a couple other volunteers so she left here just before noon. They were told that parking would be a nightmare but Fred was watching and led her to the perfect spot. They were ushered to one of the four picnic tables in the park (everyone else had to sit on the lawn) …under a nice shady tree…and told not to move from there. Water was being passed throughout the afternoon but it was still over 4 hours of waiting until Barak appeared. I was watching CNN coverage of O’s speech in York earlier that morning and he looked like the heat was doing a number on him then…but he showed up in Lancaster looking refreshed and envigorated…and they picked up coverage of his arrival in time to see him greeting the crowd and SHAKING PAT’S HAND !!!!! When my hero finally got home, well after dark, and slowly settled back down to earth… we unloaded the camera and selected a few pics for you to be able to share in the excitement. Though she did not get a photo with her candidate, she’ll settle for the handshake and the memories and is right back out there today spreading the message of hope and change that is so important to us all. Now go get out your own votes !